You know what’s crazy about living in Colorado? Yesterday we had absolutely beautiful weather with a high of 78 degrees. It was heavenly. And then today we’re supposed to get slammed with a BLIZZARD. Seriously, how is that even possible?! I know you’re all probably tired of hearing about the weather, but c’mon mother nature. That’s just not cool. 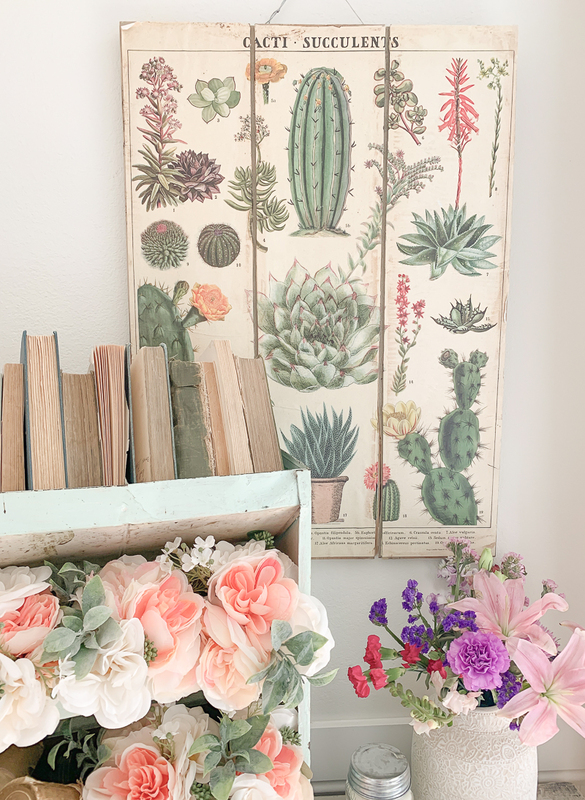 Anyway, let’s talk about happier things like the two finds I came across recently–one is an old metal fruit crate that’s the prettiest shade of soft minty green, and the other is a vintage inspired cactus print that’s super fun for spring. I’ve actually been meaning to share these pieces with you guys for a while now, I just never got around to styling them. But I finally got my booty in gear and put together a cute little spring-y corner in the dining room! Ok isn’t that the cutest little vintage crate you ever did see?! I picked it up at an antique market a few months ago and the sweet lady that sold it to me said it’s an old fruit crate. 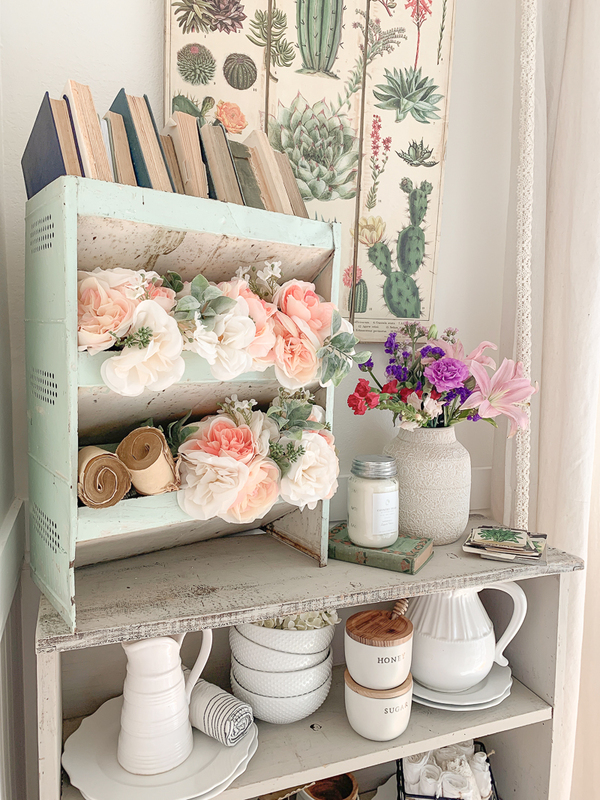 I wasn’t sure how I’d style it, but I decided to just load it up with a few old books and faux flowers for spring. I loooooooove that soft minty green color! 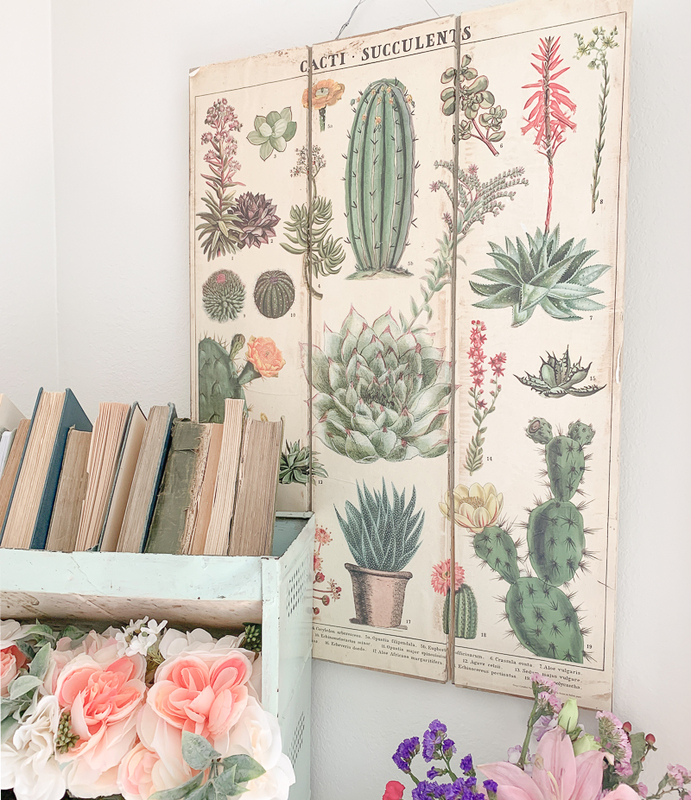 I also picked up this large cactus print at the same market–I thought it would be fun for spring and summer! That cactus print had been glued to a wooden pallet and then I put some hardware on the back so I could hang it on the wall. Fun and easy DIY art! It’s just a reproduction and I found the exact one on AMAZON!! Woohooo!!! 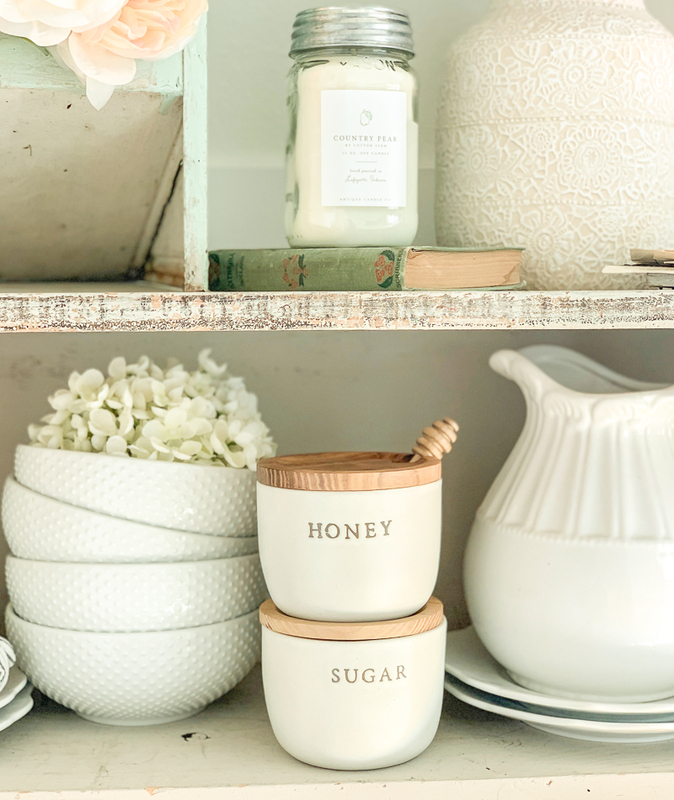 These cute little honey and sugar jars are from Target. I have a growing collection of these now and I just love them! The honey one is my favorite. 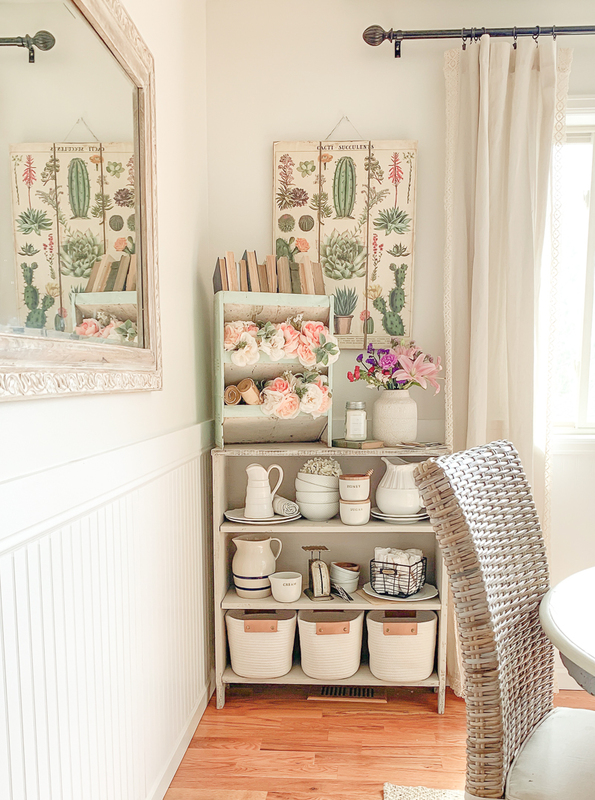 I love this little spring-y corner in our dining room. 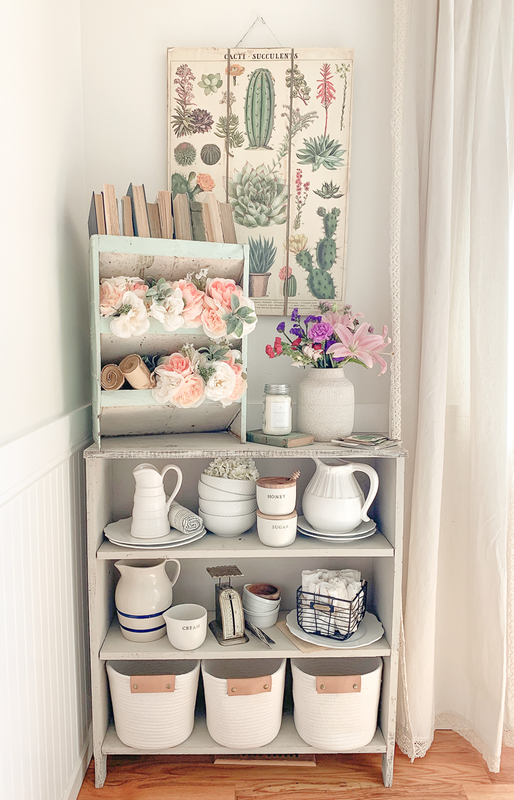 It was so fun to style these new pieces–I loved playing around with that cactus print and the vintage green fruit crate. And don’t you think that guy will be awesome for outdoor spring decor this summer?! I’m already dreaming about it on our front porch with fresh flowers. Or maybe a few little potted plants. Oh yeah, that’s definitely happening. I’m in Utah, so I totally feel your pain about the bi-polar weather! I’ll just settle for some freakin’ sun, already! Anyway…. I love your blog!! I’m right there with you Tonya!! 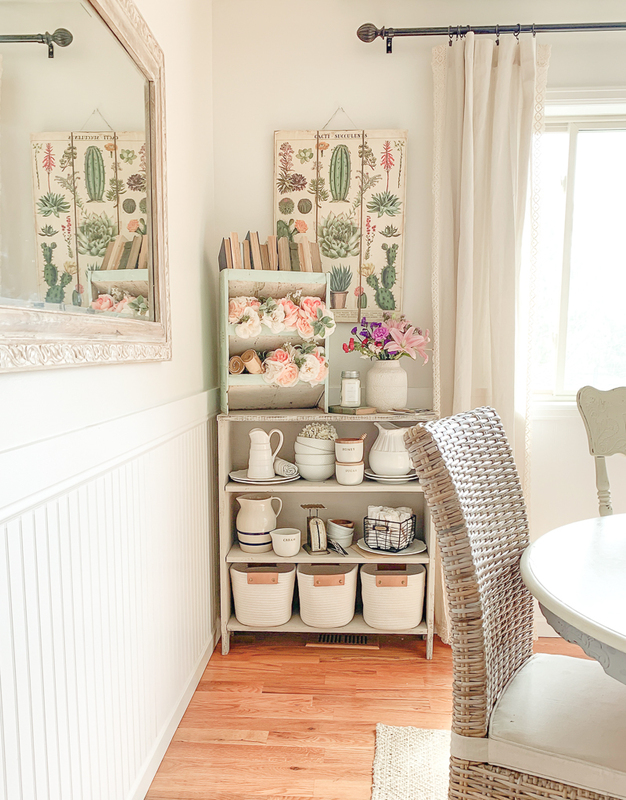 I LOVE your collection of white pitchers…would you mind sharing where you purchased them from? 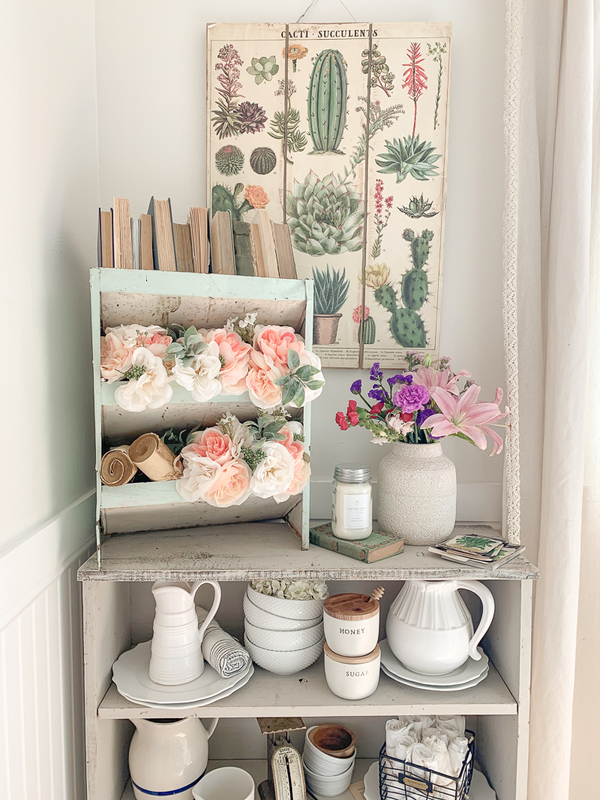 I love your spring-y corner, especially the cactus print! Wish I could purchase one, it would go perfect in my house! I’m new to you blog and I love your style! 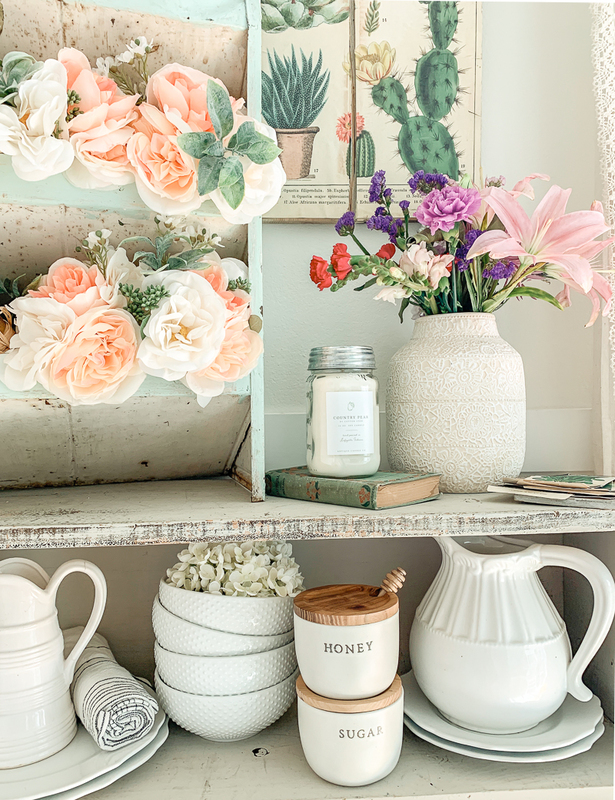 That is THE prettiest little corner! And I love the touch of lace at the bottom of your curtains. Thank you for always being such an inspiration. You’re so kind, thank you Kathy! After Easter the weather should get back to normal. Last year we had snow on the ground and it was gone by the afternoon. My Mom always said that after Easter you can expect any kind of weather. And she was right. We have had 83 degree weather all week so far and now tomorrow we are suppose to have the temperatures drop. Thank you Colorado 😊🥰 enjoy your post. Have a great day. I hope so Jonita! We usually have crazy weather through Mother’s Day weekend around here. 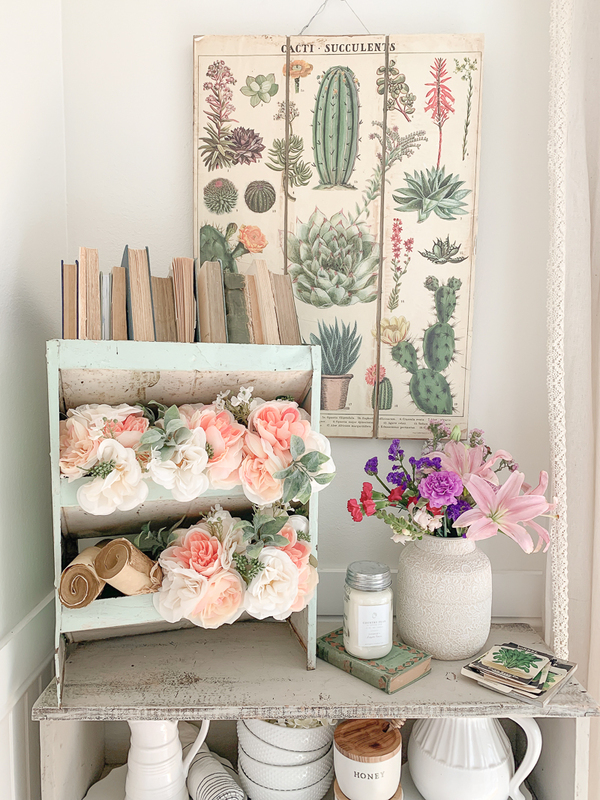 Hi Sarah I love the cactus print and how you put it on the pallet. Can you give instructions on that? Thanks! It was just glued on! Easy peasy! Just saw the chair you linked in stories and already ordered one! Remodeling bedroom and it will be perfect and great price! How do you find these sales???? Also ordered a white chaise lounge today too….me gonna get in so much trouble…kinda hard to hide brand new furniture!! But so fun! You make me spend soooo much money!!!!!! Oh that’s so awesome! I LOVE that chair. I really wanted to order it too! Ohhh I bet that’s a super cute kettle!